Are you looking to make money dropshipping with AliExpress? If so, read on to find out how AliDropship plugin works in this in-depth AliDropship review and tutorial! AliDropship plugin transforms any WordPress site into an ecommerce store in just a few clicks. All you have to do is install it on your WordPress site and instantly all of the vital elements for a functional drop shipping store will be available to you including: product pages, shopping cart, payment gateways. AliDropship plugin is already being used by thousands of people all over the globe. Both newcomers and experienced online business owners buy the plugin because it offers an easy, efficient way to dropship products and manage an ecommerce store. AliDropship plugin lets a store owner have full control over their business, and means the absolute freedom in terms of the store management. This plugin links to your WordPress site and helps you pick products directly from AliExpress. As the result, the products along with their title, description, photos and reviews are automatically imported into your website. There are two ways to use AliDropship. One way is to order a custom store. In this case, a dedicated expert team creates a unique webstore according to your requirements and preferences. This way, you become a 100% owner of an independent dropshipping website on the AliDropship platform. The second option is to install AliDropship plugin on your own and design your store yourself. You can start from scratch or work with your existing site. Say you already have a WordPress website (even a simple blog), you can easily transform it into a fully functional ecommerce store. It lets you edit single product pages as well as category pages and bring unique content on them. In addition, you will enjoy the built-in Image Editor that lets you improve the on-site pictures with no need for additional programs like Photoshop. The plugin helps you to run sales and promotions by offering your visitors custom coupon codes. You can also engage your customers and encourage sales with product reviews that can be automatically imported into your site directly from AliExpress. No more worries about how to optimize your product pages for the search engines. It will all be done for you with product specific meta tags, titles, descriptions and keywords and etc. Enable the smart email notifications to create a powerful marketing tool that increases your conversion rate and brings you new and repeat buyers! The plugin supports all the most popular payment processors including PayPal, 2CO, Stripe, PayU and many more. Now about one of the most important factors in ensuring that you manage your business. AliDropship allows you to closely manage your entire inventory. You can track your stock counts and instantly stop selling any of products when the inventory is low or about to run out. Hosting is an absolutely necessary for any online store. Without quality hosting, you can’t ensure that your store will always be available, especially during peak demand times, such as the holidays. When it comes to running an ecommerce store online, shared hosting options simply won’t cut it. Instead, AliDropship offers a variety of convenient hosting options to meet your budget and traffic volumes. The cost starts from $48 per year and includes a free SSL certificate, an in-store element that proves it to customers that it is safe to make payments on your website. To maximize your success with your ecommerce store, consider purchasing the marketing add-ons that AliDropship offers. Marketing add-ons are your best solution for delivering stable organic traffic from social networks, they can help stimulate impulse buying, simplify email marketing and much more. If you require special functionality, the add-on library offers everything you need with several items like Recent Sales Pop-Up, Countdown Timer and Facebook Business add-on. While some of the add-ons are available for a one-time fee, many others are available free of charge! The AliDropship Plugin is intended for anyone who wants to create their own online dropshipping store by using AliExpress to supply products. The plugin is also a perfect for people who don’t want to pay monthly service fees (other than hosting) to maintain an online store. I highly recommend this plugin as a convenient way to monetize your hobby, or a blog that you’ve already created, so that you can make money from an activity that you already enjoy! 9. Then click on “Place Order Automatically” within the WordPress Dashboard. This step opens AliExpress and sends the customer’s order details to a form. Then you will just submit the payment to the AliExpress Supplier using your credit card or PayPal. 10. The AliExpress Supplier will confirm the order and ship it to your customer. Upon delivery of the product to your customer’s home, you will receive a notification. AliDropship Pricing: How Much Does It Cost? 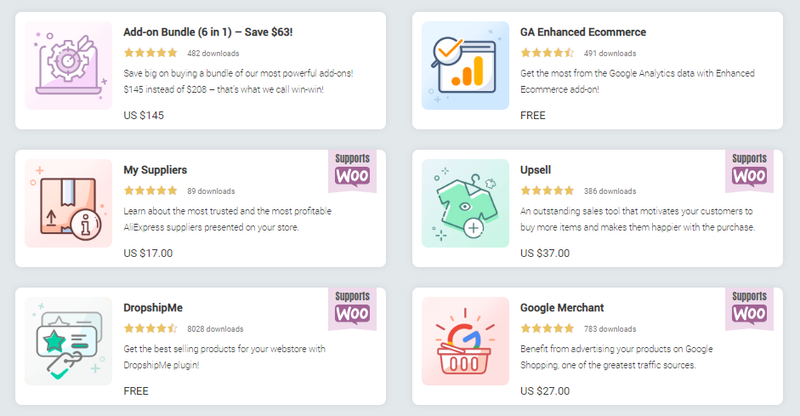 AliDropship’s WordPress plugin only costs $89, and this one-time payment covers updates, lifetime support, automation, unlimited products and the core features mentioned above. If you’ve decided that you want to order a custom dropshipping store, there are three packages to choose from. The basic one costs $299 and includes 50 pre-imported products selected and edited by the team. There are no limitations on the amount of products you can import. Other custom plans cost $499 and $899. These upgrades come with unique benefits, such as promo videos for your products and social media promotional tools. All the packages require just a single a one-time payment; there are no recurring fees and you’ll get lifetime support. If you’re trying to decide whether you should purchase this plugin or another option like Shopify – I definitely recommend that you coose this option. It’s less expensive and requires much less effort to get setup. You’ll also have a lot more flexibility when it comes to the customization of your ecommerce store since you can run it on your existing website or have the AliDropship team built a website on your behalf. If you want to learn more, you can view the success stories here of people who have made thousands with AliDropship.